Some SEO experts may argue that keywords are not as important as they once were, but I think most would agree that they still most definitely have their place, as does keyword research. If you are serious about generating quality web traffic, an understanding of how to use long-tail keywords is essential. However, popular keywords are highly competitive and it can take time to build up enough authority for high-volume keywords in SEO. What’s more, the cost can be substantial, as well as the time invested in research, so it’s necessary to look at the bigger picture. Long-tail keywords are much less competitive, are more specifically targeted and can make a real difference to your campaign, giving an extra dimension to your SEM efforts. Simply put, they are more of a phrase than keyword, usually of more than three words, which are more specific in search terms. So for example, if you own a florist, then you will want to use the term ‘flowers’, of course. However, the person doing the searching might be looking for something more specific, such as ‘yellow roses’, which is not quite as broad as flowers only. You can see then how these can also be built on. In PPC, long-tail keywords are much more cost-effective than their broad, one-word counterparts and can drive higher CTRs. Whether you use competitive key terms or not, a grasp of how to use long-tail keywords should always make up a part of your SEM campaign. 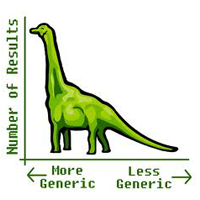 There are a few tactics that can be employed to find effective long-tail keywords. Firstly by looking at something as simple as Google Suggest, it’s surprising what you might come up with. Thinking about it, when you begin to type into Google, what’s suggested are often common searches, so by trying out a few combinations, you can arrive at some excellent ideas and starting points for using long-tail keywords. Of course, not all of these will be suitable, as I’m sure anyone who has used Google may have noticed. It’s a good starting point though, all the same. Sticking with Google, scroll to the bottom of a search page and you will see the related searches links, which can prompt further ideas. Another idea is to use Google Trends to see which search terms relating to your business are hot at the moment. So again, sticking with flowers, if this is typed into Trends, then it will return a graph showing you how much interest this word gets, related words, how it’s competing in your area and words/terms that are rising in popularity. This is a great tool for keyword research and can be used as well as the Google AdWords tool to really help to kick-start your ideas and research. It’s a good idea in fact to use as many keyword suggestion tools as you can, preferably from the larger sites. YouTube have one and so do Twitter, Amazon, eBay and of course Bing. Whilst you can get third-party software to help too, it’s wise to ensure that it’s reputable by reading online reviews and asking friends who may be in the know when it comes to SEM. This is the best resource for finding keywords there is and to find long-tail keywords it’s just a matter of typing two or three words into the keyword tool. This will return results that are 3 or 4 words long, which can be searched again until the right term for you has been found. For example, if you were to start with ‘flowers’, you will see results such as ‘mother’s day flowers’ returned. If you then go on to type in ‘pink flowers’, you’ll see more three-word results, such as ‘pink spring flowers’. As you can see, this can give you a lot more scope and opportunity when it comes to learning how to use long-tail keywords. If you use suggest tools, alongside keyword tools, then you’re increasing your chances of success even more. For help in improving your web traffic, click here to learn about our content marketing and SEO services.